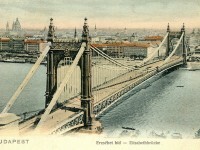 Would you like to spend a perfect week in the beautiful Hungarian capital at the beginning of April? We found you a good flight deal from New York to Budapest from April 1 to April 8, 2014. 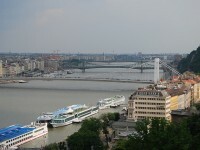 Book now your Aeroflot flight from New York to Budapest from $821 and save money! The flight has a stop at Moscow. If you would like to look for other deals to see if there is a flight that suits you better or has an even better price, search for the best flights to Budapest from New York in the box below between the offers of our partners. Check more than one provider; you can search for even all of them, to find the best offer. You will fly from the New York Kennedy Airport (JFK) to the Moscow Sheremetye Airport (SVO), where you have a 6 hours and 20 minutes stop, and then you fly to the Budapest Ferihegy Airport (BUD). On your way back you have an almost 15 hours stop at Moscow. During this flight you have the opportunity to visit the city of Moscow and to see the major tourist attractions. 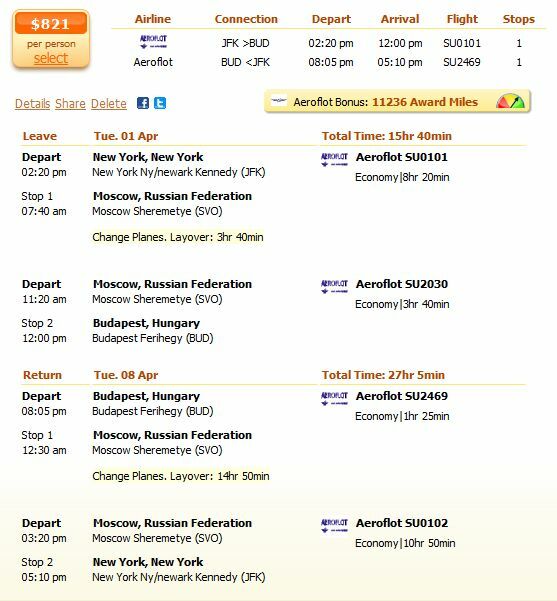 See this flight deal more detailed on the screenshot below. 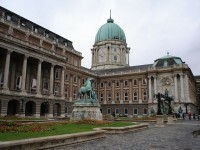 The next best deal to Budapest has the Lufthansa for $900. The Major Carrier has tickets for $901, the LOT Polish Airline and the Thy Turkish Airline from $902. All of them have one stop somewhere. The Aeroflot Airlines allows you to have a free baggage under 23 kg and 158 cm. Of you have additional baggage or it is oversize or overweight, you will pay between 50-150 USD.